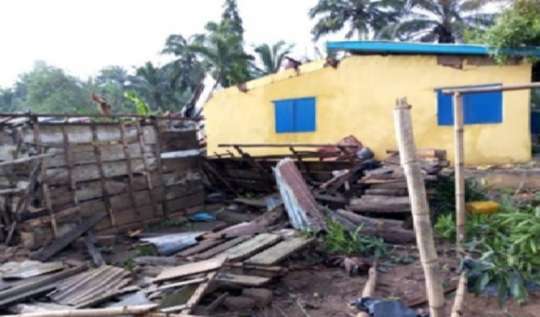 Mr. Emmanuel Obeng, the Sekyere-Kumawu District Director of the National Management Disaster Organisation (NADMO), has counselled landlords and other property owners to renovate their weak buildings to make them disaster-resistant, with the onset of the rainy season. He gave the advice when he and his team toured the Oyoko, Dadease and Kumawu Communities in the District after heavy rainstorm accompanied with strong winds ravaged those communities last Tuesday, leaving in its wake massive destruction to buildings whiles also displacing families. He said per NADMO’s initial assessment report, in excess of 100 homes, were affected by the disaster in both Kumawu and Oyoko, and was on record to be the highest over so many years. Households, schools, churches and poultry farms and the police station in the Oyoko, Dadease and Kumawu communities, were among the places most affected. Building that got damaged included the Boys and Girls Dormitories of the Dadease Agric Senior High School, the Primary Block of both the Dasease Salvation Army Basic School and the Oyoko Methodist School, the Oyoko Methodist Church. Part of the roofing of the Police Station at Oyoko was also ripped off, leaving most official documents drenched with the rain water. There was however, no fatalities. Mr Obeng said the visit was to enable his office assess the extent of damage, identify with the victims and subsequently send a comprehensive report to the head office to a response in the form of assistance package to the victims. The NADMO Director urged the public to clear gutters and avoid throwing rubbish into drains and on the streets to choke them, since that could cause flooding during the rainy season. Mr. Paul Antwi Oppong, the District Education Director, who accompanied the visiting team, encouraged the affected school authorities, teachers and students not to be discouraged about the damage caused by the rainstorm, but remain focused on their normal routine teaching and learning. He said his office would contribute its best by engaging the necessary stakeholders to provide the needed support as a contingency measure to avoid future occurrences.